The Frazer Tickford Metro was introduced in 1981 at a price of £11,700 and was contructed by Aston Martin's special engineering department, Tickford. The specification included a full leather interior including the dashboard and door cards, Wilton carpeting throughout, Uher stack stereo with a graphic equaliser, a full bodykit, four Marchal fog lights, enamel name badges, tinted glass, sunroof, 5 1/2J alloy wheels, and electric windows and mirrors. The engine was tuned with a Weber twin choke carburettor, a hotter camshaft and bigger valves with a gas flowed cylinder head and gave out 80 bhp. Twenty six cars were built three of which are believed to be left hand drive. The special, one owner, Tickford Metro that we have was supplied new in left hand drive form by Aston Martin Tickford in 1984 to a local gentleman who then shipped it straight to his address in Beverly Hills, California as he was working out there. It came back to the UK in 1986 and was used sparingly and then put in to dry storage. It has only covered 9,600 miles since new with its one owner, and is in immaculate condition throughout. It has recently been re-commissioned with a full service and brake overhaul and the wheels have been refurbished and fitted with new tyres. The paintwork has been refreshed because the original finish had deteriorated but no body repairs were necessary. The history file includes all the original brochures and printed material for the Tickford Metros, the sale invoice from Aston Martin as well as the documentation for the export to the United States. 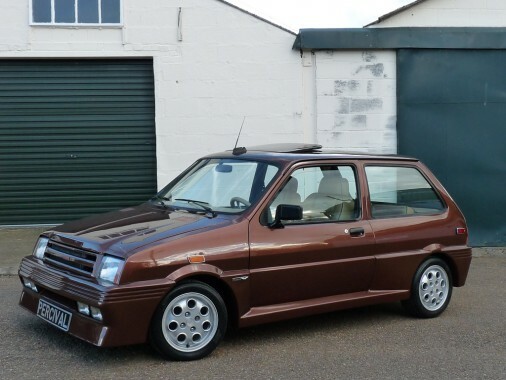 Very rare and in superb order, this Tickford Metro should be in your collection!